Dear Readers, on a day when the weather in London is so cold that I’ve put plastic buckets over the frogspawn in my pond in case the water freezes, it’s a real pleasure to think back to the last part of my holiday in Costa Rica. 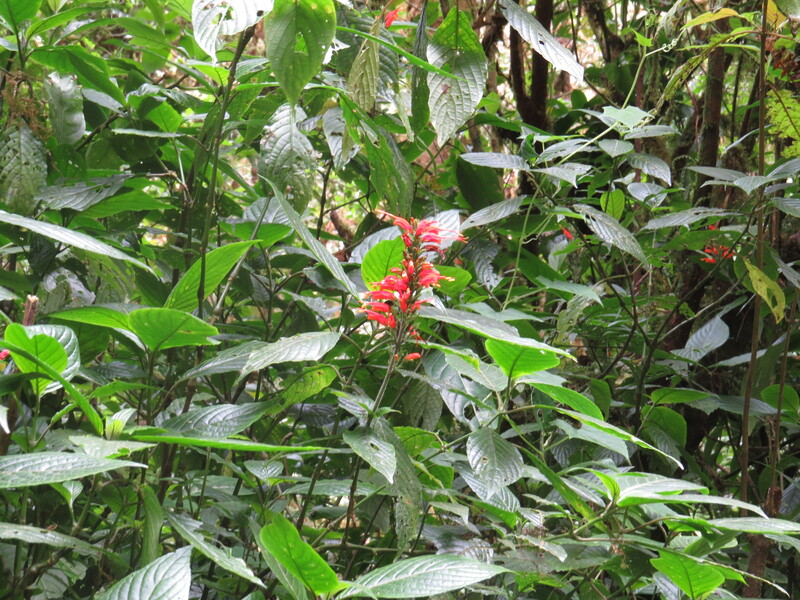 The final stop was the cloud forest around Monteverde in the central part of the country. 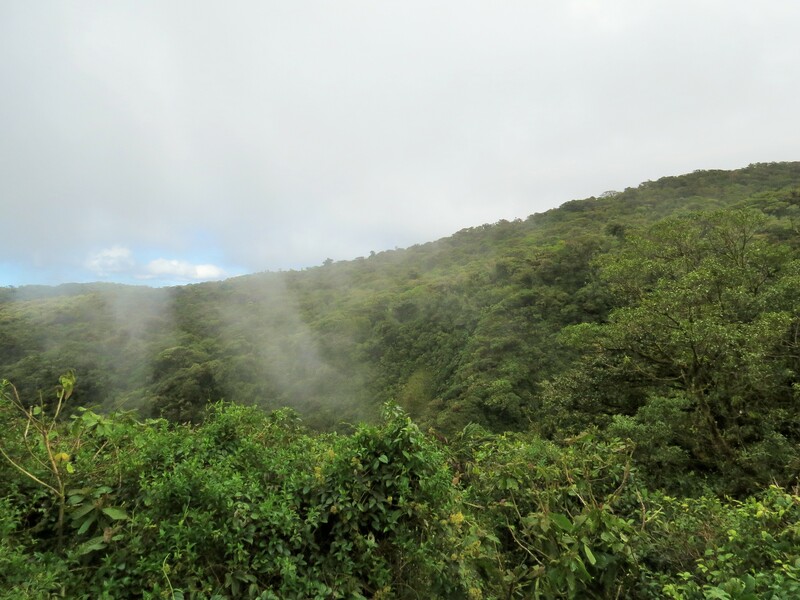 These areas are not called ‘cloud forest’ for nothing: it was surprisingly cool, and we were relieved when we got to our hotel to see that we had duvets on the beds instead of the usual sheets. 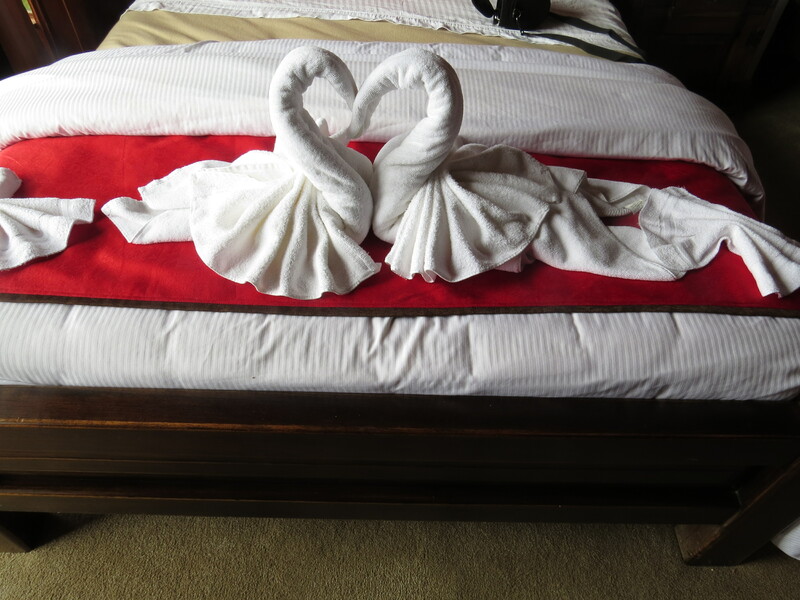 There was also a fine example of towel art. We started off with a canopy forest walk in Selvatura. In truth, I’d been a bit worried about this: as I’ve gotten older my head for heights has disappeared. I’m fine walking up and down the mountain tracks in Austria, but present me with one of those bridges with a see-through metal grid to walk across, and you might find me wobbling a bit. What would happen if I froze halfway across, and was unable to move on? Would I have to be rescued by a handsome Costa Rican? Would he have to winch me up into his helicopter? Anyway, moving swiftly on, when we arrived and actually saw the bridges, it seemed that I was not the only one with a problem. At least half of us spent the next few hours walking briskly across the bridges, eyes front, hanging on to the rails on both sides. Our guide, Walter, was Very Disappointed with us. ‘The idea is to see the different levels of the canopy’, he said. ‘You could stop and look and see what you could see’. Yes, that would be lovely, but stopping and looking was an impossibility, because then I would notice that I was 240 feet above the ground. We had clearly let him down, but at least no helicopters were involved. Every so often there was a scream as someone shot by on a zipwire hanging from the very top of the canopy. And good luck to them, I say. I was just glad when bridge number eight was completed and we were back on solid ground. It had gotten a little easier as we’d gone along, and I was glad that I’d done it, but still. I was looking forward to the next day when we would go for a nice, normal walk through the forest. 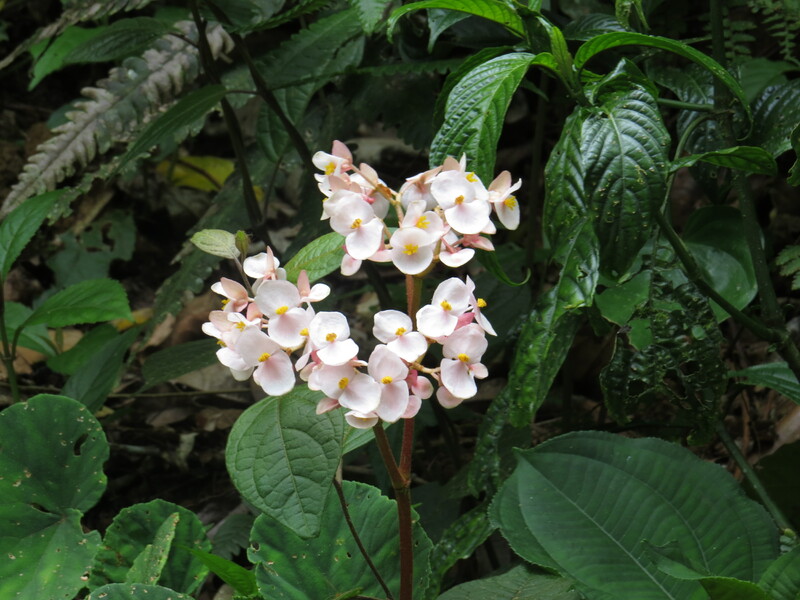 One thing I didn’t expect to see in a cloud forest in Costa Rica was a wild begonia, but they were everywhere. While it doesn’t surprise me to see the bromeliads and the ferns, I suppose I’d never given a thought to where our humbler houseplants come from, but here they were. 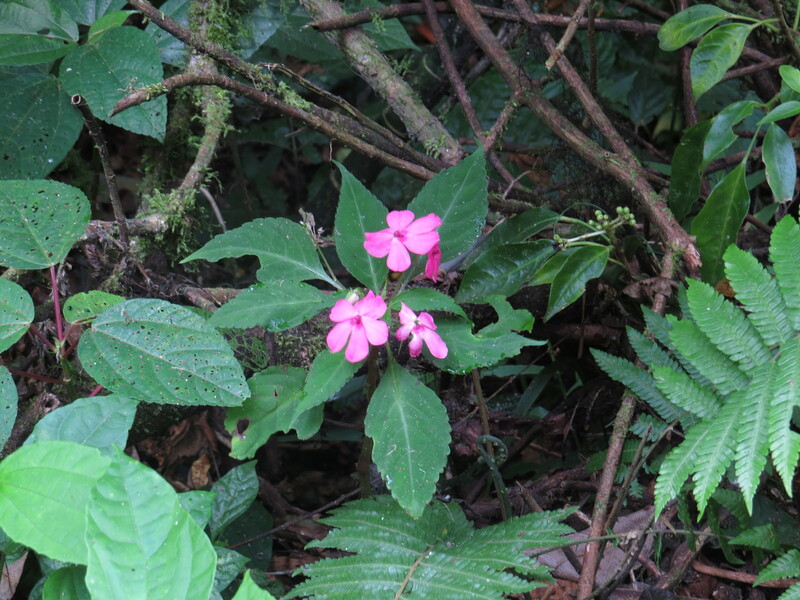 This plant is an East African native, but the plant as we know it ‘escaped’ in Costa Rica many years ago. One of these wildlings caught the eye of Claude Hope, an American horticulturalist living in Costa Rica. It was he who turned the plant in to the popular bedding plant that it was until very recently, when downy mildew caused its downfall. This one was living very happily in a shady spot, much as it did in gardens on both sides of the Atlantic. 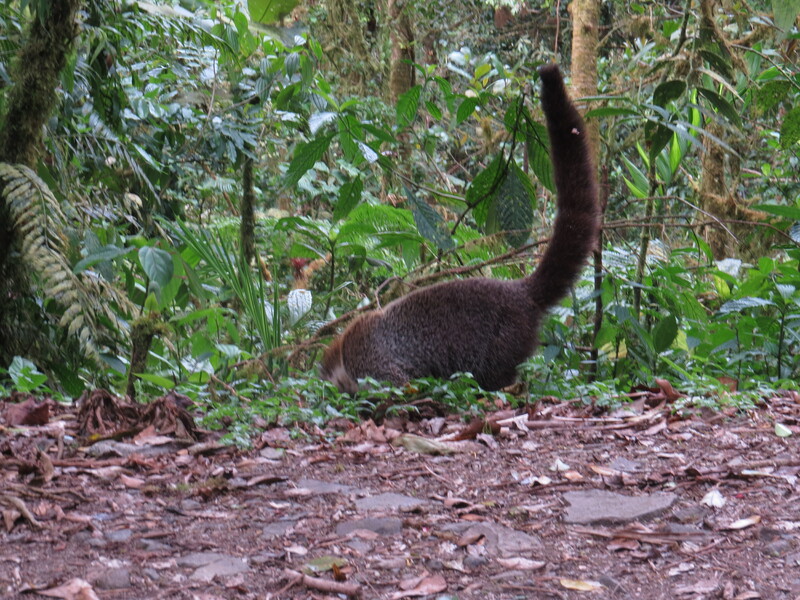 Our walk was brought to a halt by the presence of a very confident coati mundi, snuffling along the roadside and ignoring us all. He had a damaged front paw, but was otherwise in lovely condition. He spent so much time with his head down that getting a shot of his face was impossible (for me, anyhow). 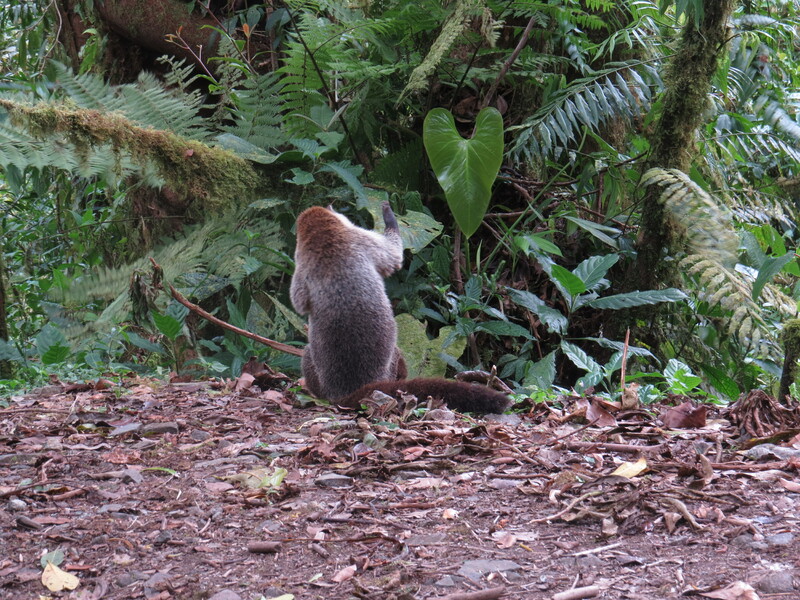 Costa Rica has raccoons, oppossums and coati mundi, and seems to manage without shooting any of them. Take note, governments everywhere. You don’t have to massacre your wildlife. 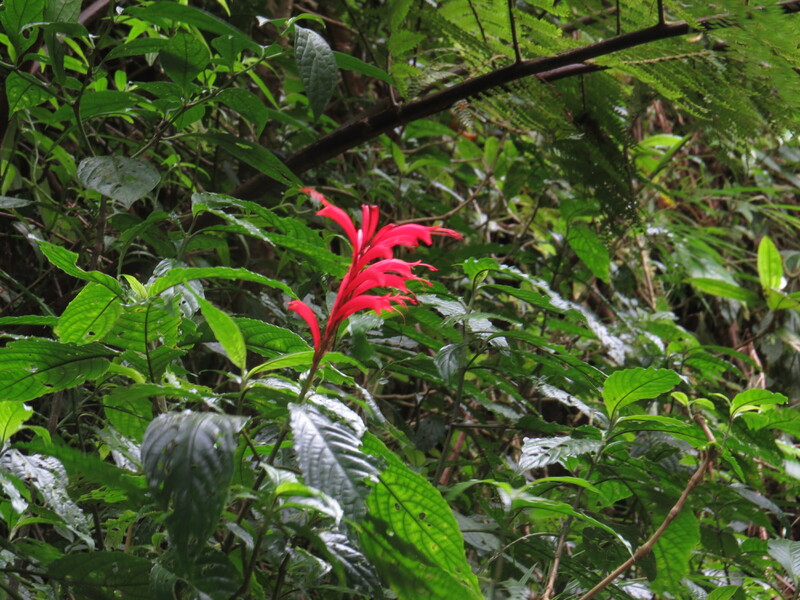 There are a fine array of red-flowered plants, just waiting for a hummingbird to pop along to pollinate them. The red shrimp plant has its stamens positioned so that they tap the hummingbird on the back of the neck and deposit some pollen while s/he is feeding, like the Queen dubbing a Knight with her sword. We spent some time looking into the fist-shaped holes in the banks of the forest. These are made by tarantulas, and by the look of it the place must be a positive tarantula party-zone after dark. One of the guides found a hole with a resident, and shone his torch in so we could get a glance of a shy spider’s bum. I decided not to take a picture to preserve the creature’s privacy. They are largely self-effacing creatures, with no desire for publicity. I remember visiting the Bug Museum in Victoria, Canada when I was on my honeymoon, and getting the chance to hold a tarantula. The poor thing actually cringed when I gently stroked its abdomen, and it taught me two things. One – never again to handle a creature that didn’t want to be handled unless it was in danger and needed to be moved. Two – I had married the right person – my husband is not comfortable around insects, and yet took me to a place full of hissing cockroaches and giant millipedes so that I could enjoy myself. We walked to a look out point, where we could look out over the trees without feeling vertiginous. The wind nearly blew us over when we came out of the cover of the forest, but there was a patch of blue sky ‘just large enough to make a sailor’s breeches’ in the distance, and the weather cleared within a few hours. 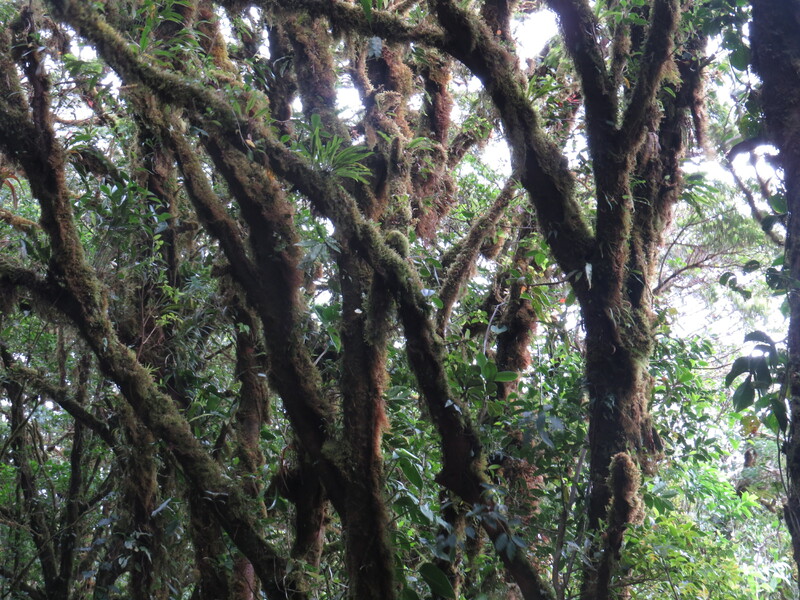 The cloud forest trees are hung with moss and lichens, which are making the most of the damp, humid atmosphere. 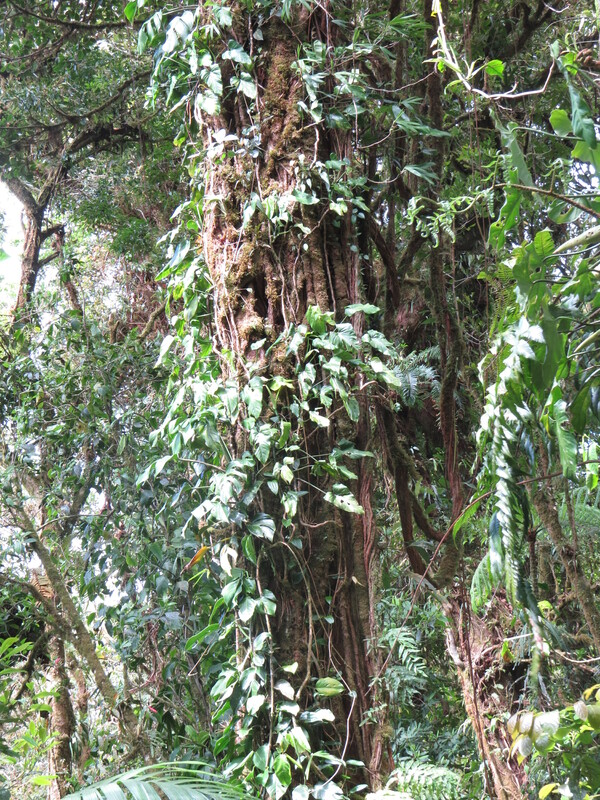 Each tree is its own ecosystem, with its branches hung with epiphytes and bromeliads, and its trunk smothered in vines. 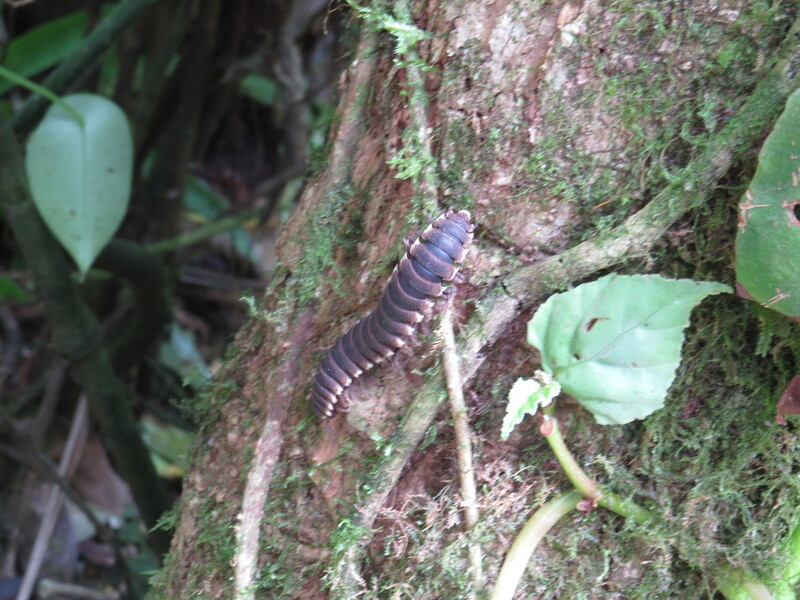 However, compared to the giant millipedes of West Africa, this creature is decidedly medium-sized. 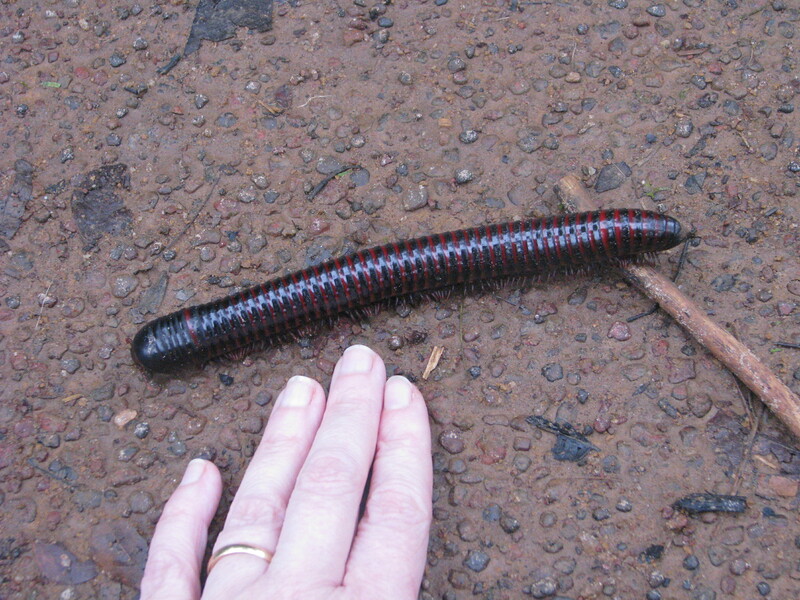 Giant millipede from Cameroon. I rest my case. Incidentally, millipedes are herbivorous and do not bite. Centipedes are carnivorous, and some of the larger tropical ones have the most painful bites in the animal kingdom, so it’s as well not to get them muddled up. 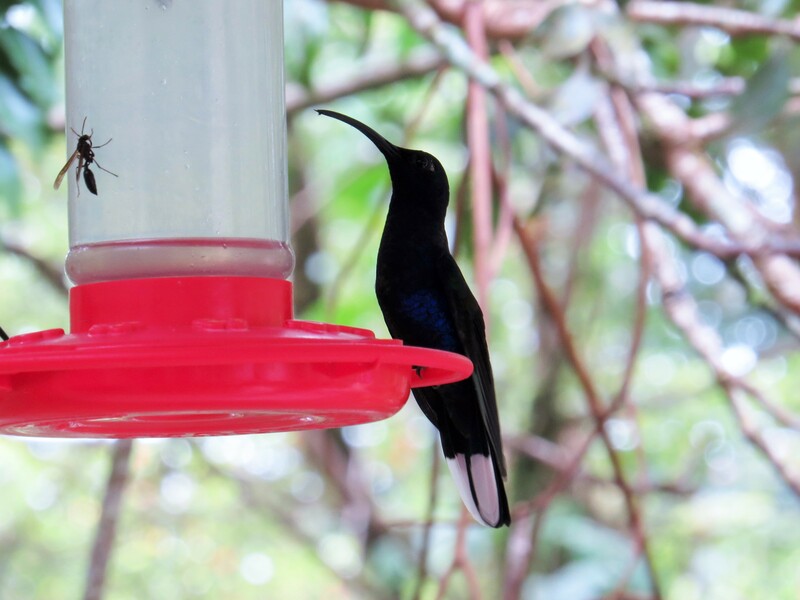 When we arrived back at the bottom of the trail, we had a rest at the cafe, which has put up some hummingbird feeders. Seven different species come to drink the nectar, along with some very large wasps and an occasional bat. 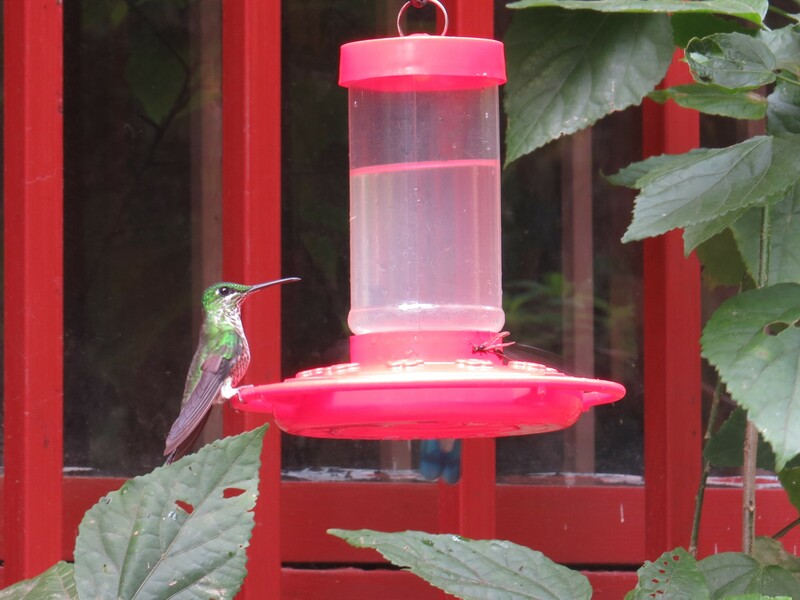 It was such a privilege to sit and watch these jewel-like birds zapping in and out. They are mightily feisty for such small creatures, and you wouldn’t want to make one cross I suspect – some of them are armed with beaks longer than their bodies, and although these have evolved largely to enable them to feed from specific flowers, the birds are not averse to skewering an opponent. And so, it was time to return to our hotel, and almost time to go home. But I had one last treat in store. On a walk around the hotel grounds with my camera, I spotted this fine bird, who posed on top of a streetlight for a good ten minutes. 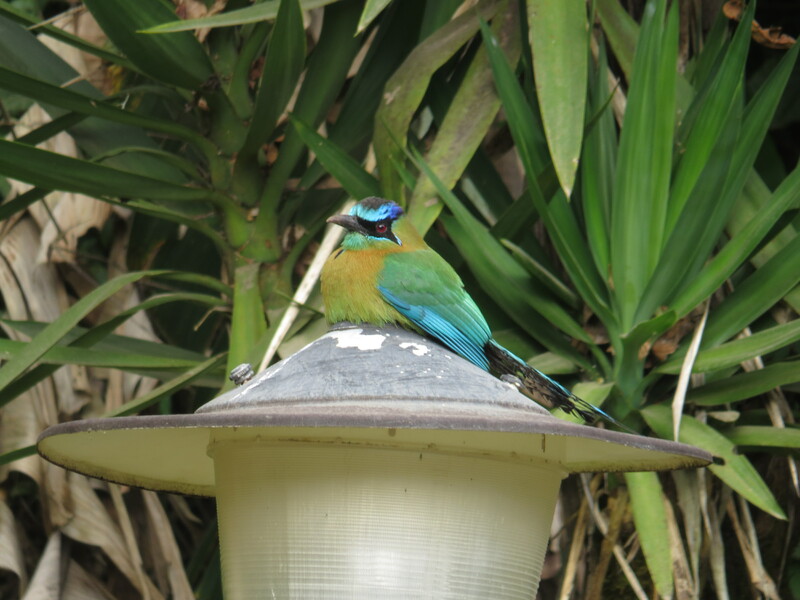 S/he is a blue-crowned motmot, and apparently spends lots of time sitting around and scanning the area for the lizards and frogs and large insects that s/he eats. What you can’t see in the photo is the rather splendid tail, which is bald apart from two round areas of feathers at the end. These are swung in a pendulum-like motion, giving the bird the alternative name of ‘clock bird’. And so, it was time to head back to the UK. 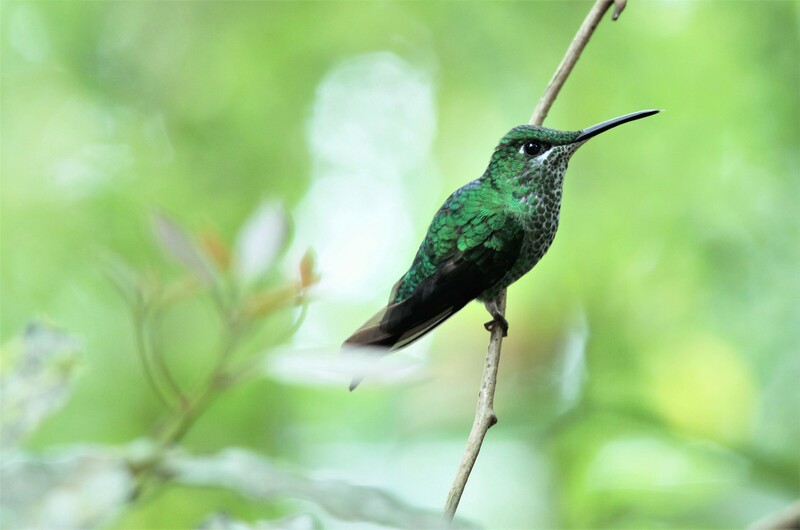 Costa Rica is a great introduction to the treasures of Central and South America, with its well-functioning tourist infrastructure, friendly people and wealth of natural treasures. It feels like a place that should be supported in its endeavours to be ecologically and socially responsible, a small country with a big heart. We have much to learn from Costa Rica about the right way to build a community. I hope that, one day, I’ll be back to explore the Pacific coast, home of the jaguar and the macaw. In the meantime, adios Costa Rica, and gracias. This entry was posted in Bugwoman on Location on March 17, 2018 by Bug Woman. That bridge … Don’t know how you managed it. Lovely to read about so many aspects of CR. Can see why their ecotourism is doing so well.